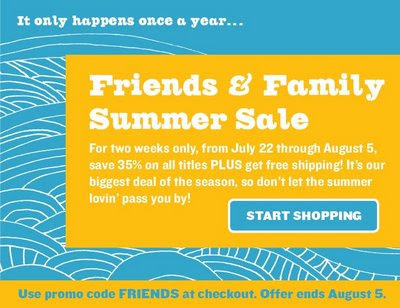 35% off: Chronicle Books' Friends and Family Summer Sale! Go, now, buy books!! And these books can't be taken away from you like the ones you buy on your Kindle. How nice you started the sale on my birthday! Thank-you!!! It was all for you, Matt. Check out Facebook. I like you Todd, and want to be friends. Well, Matt, there are more of you out there than you might have guessed.